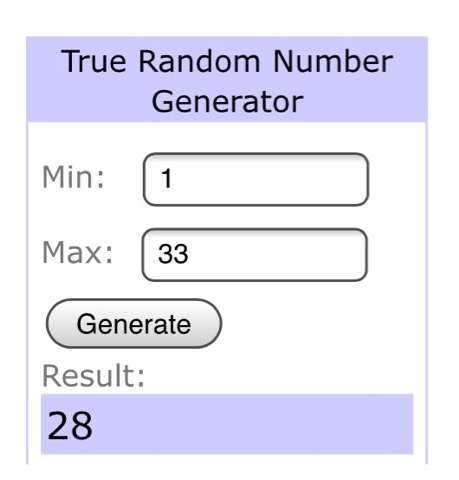 One of the winners didn't contact me by 28/10/15 and so here's a new name. I experimented 3 times to get the right texture for me, with some height. So, my colleagues became my guinea pigs, of which they didn't mind. 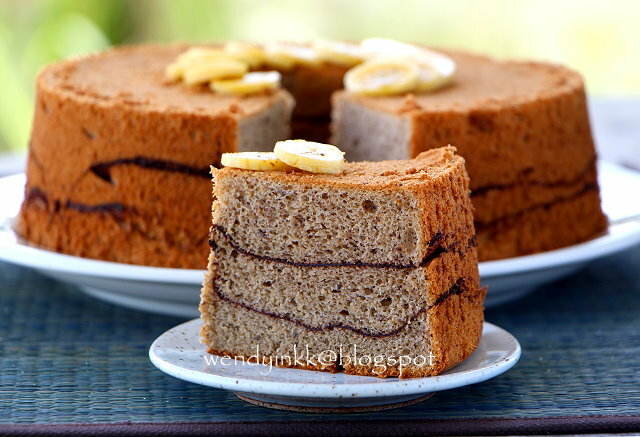 Bakes with bananas are always greatly welcomed. I have a colleague who was pregnant at that time, and she loved this so much. It's been almost a year since she last ate a piece of this, and she still tells me she missed this. The second book I received from Tuttle Publishers. I went through the book a a few times.. and I needed to convince myself that there is something good in there. I've never been to Vietnam. My experience of eating Vietnamese food depends on the restaurants. The more variety it offers, then only, I get to try something new. I first had a piece of this, not too long ago, maybe 5 years back? And I was smitten by the taste and texture. 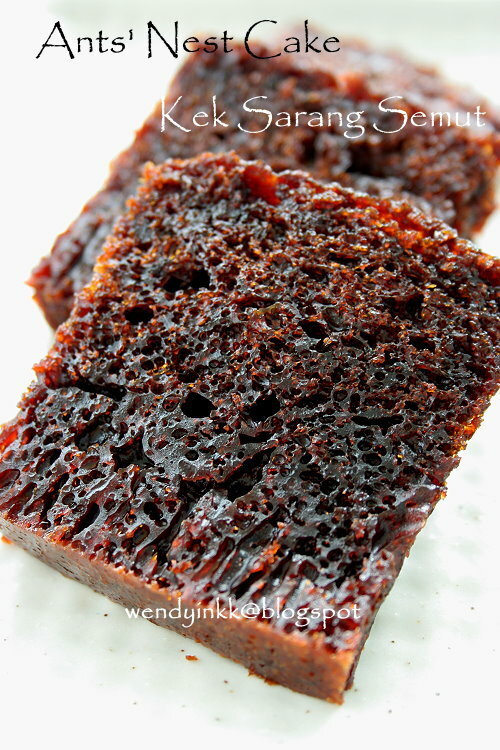 My SIL baked it for the 2nd time and I asked her if she put in any cocoa powder, because it felt like I was eating a bouncy chewy chocolate cake. She said no, it’s just caramel. I was totally taken by surprise. I call this Sweet Vanilla Cake as it looked sweet to me... sweet feeling, not sweet tasting. 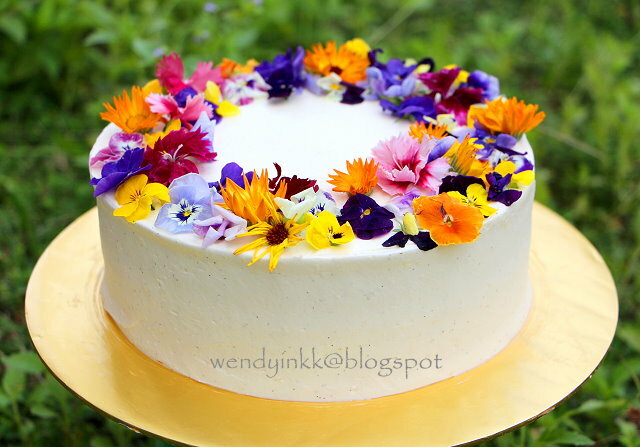 I saw my friends making Korean Style Flower Buttercream deco and they were so pretty. I can't pipe like that, and so when I saw these fresh edible flowers in Cold Storage Sunway Pyramid, I quickly bought them. I planned to make a cake once I get home few days later. I wanted to do a vanilla buttercream that has vanilla seeds infused in it. I remember many years ago, while reading up on buttercreams, there is one type that is cooked and goes without eggs. 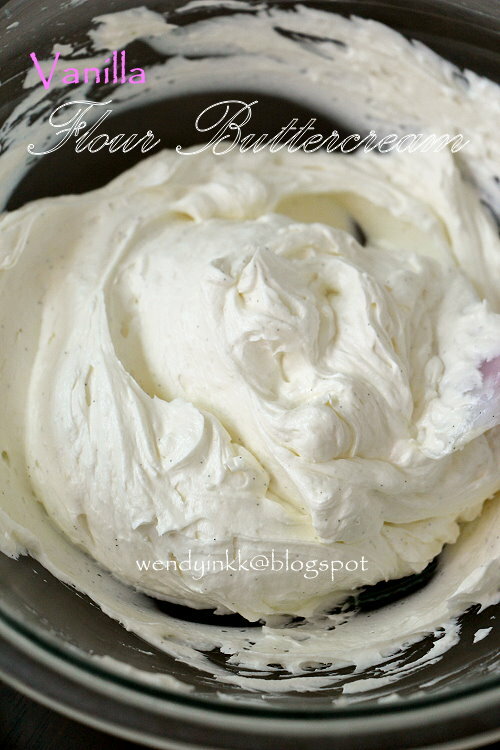 Some calls it whipped buttercream, some call it flour buttercream. I think flour buttercream will make one 'differentiate' it immediately. It is actually called Ermine Icing or Frosting. This type of buttercream will be suitable for those who want to go egg free, but want a lighter buttercream that differs from the typical ''butter + icing sugar'' ultra sweet buttercream. And for those who find half cooked egg whites in buttercream icky. I just made these out of curiosity. They didn't really turn out well, as I find the crust to be not well baked. And there's no flaky effect. So, there's no need to share the recipe. 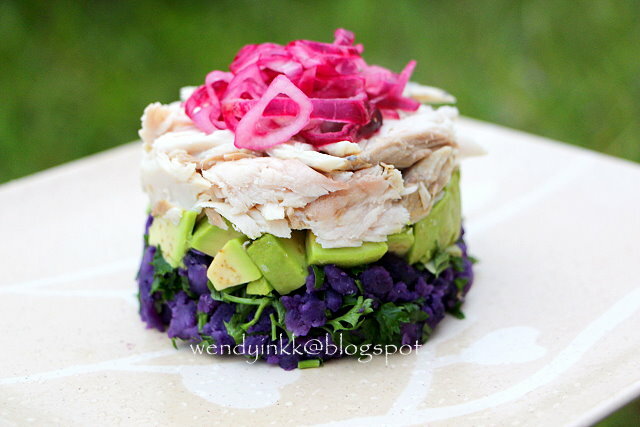 But I'd like to share with you, how I got my purple streaks, without the use of any artificial food colouring. 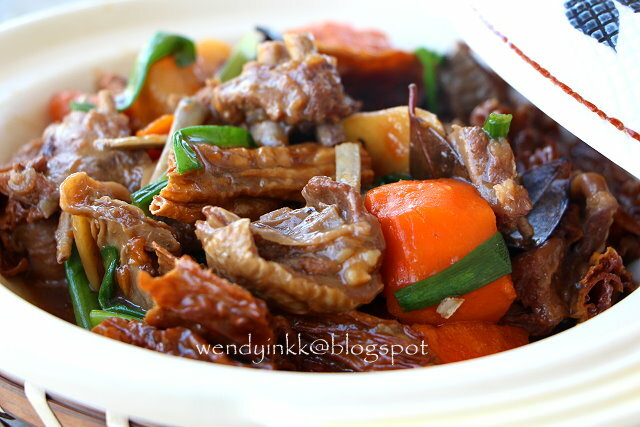 I had a big nice Guangxi Taro left after Chinese New Year, and so I tried making this. Somehow, I prefer the non fried version, that yields a more powdery filling. This one has a texture similar to lotus paste, although not as heavy. Eliza didn't contact me and it's Thursday already. 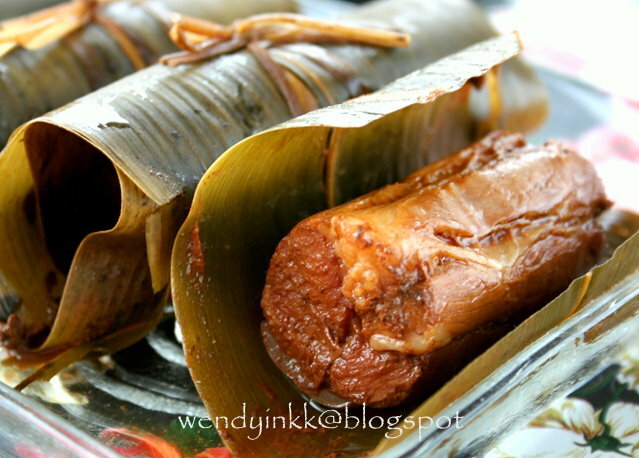 Kuih Koci is a chewy dumpling wrapped in banana leaf, with sweet coconut filling. The 'skin' can come in green, purple or white, depending on the ingredients used. 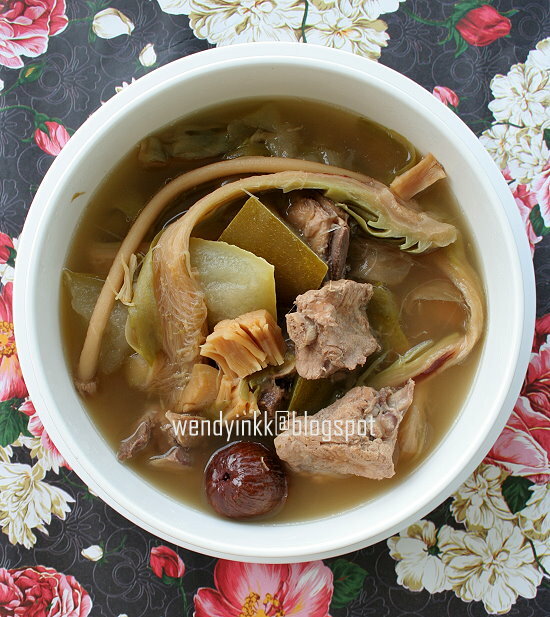 The Cantonese community here calls this as 鸡脚指 'gai geok jee' that means Chicken Claws. 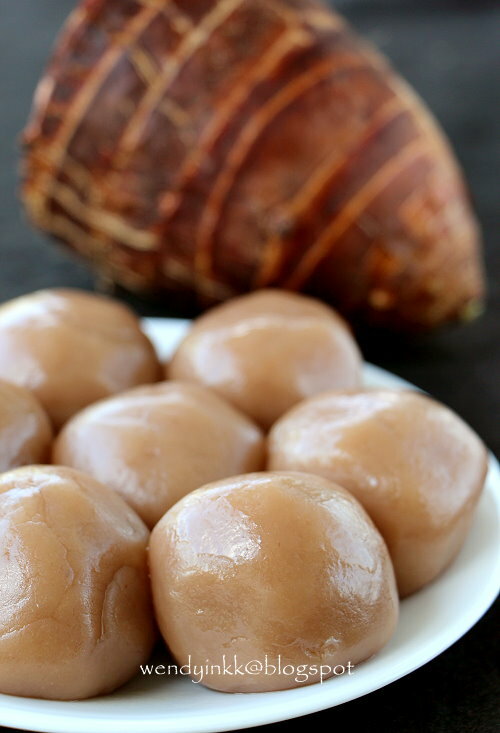 It's just a nickname due to the similarity in the sound 'Kuih Koci' with 'Gai Geok Jee'. I'm not sure if there are any other names for this kuih. 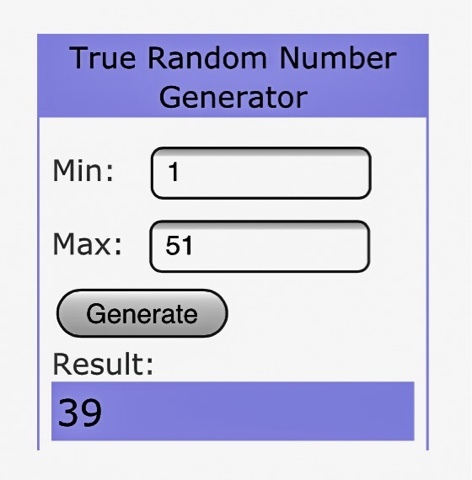 Heavenly Fragrance Cookbook Giveaway Winner! 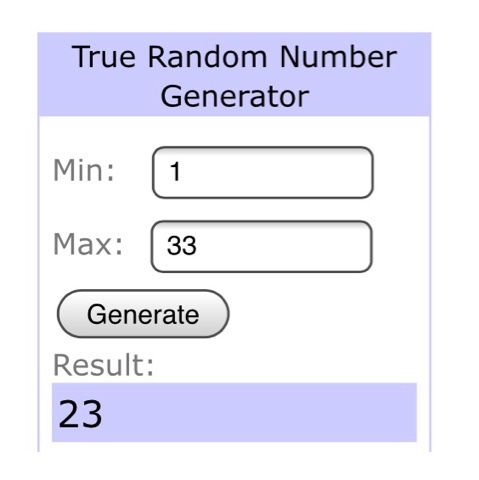 These are the winners for the giveaway. 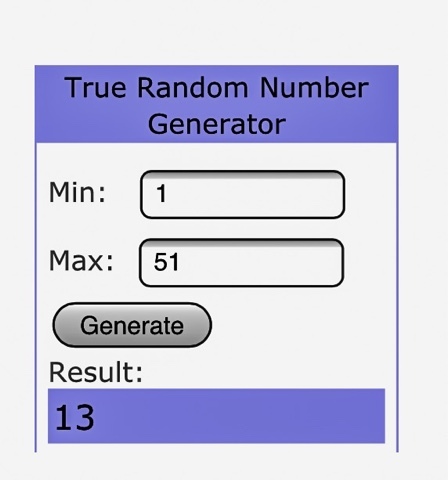 I was given 4 books to review. This is the first book that I went through, Heavenly Fragrance: Cooking with Aromatic Asian Herbs, Fruits, Spices and Seasonings by Carol Selva Rajah. Carol has written a few books before and you might have seen a few of her books in bookstores. 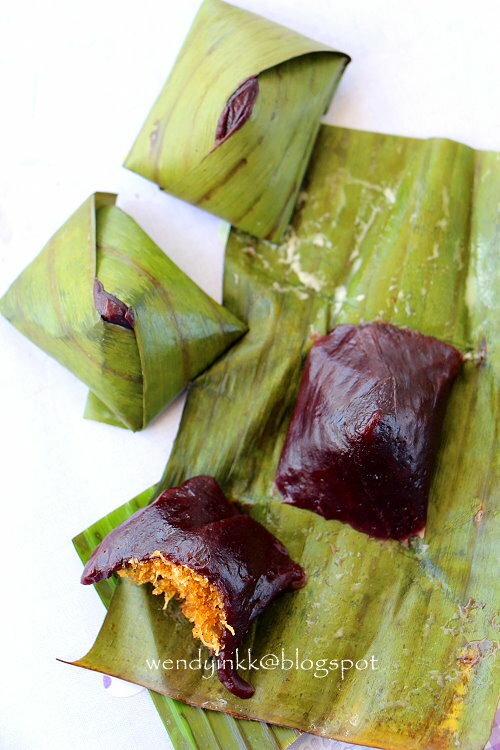 Malaysian school's home science textbooks calls this kuih ketayap. In Malaysian kuih, this filling is one of the basics. 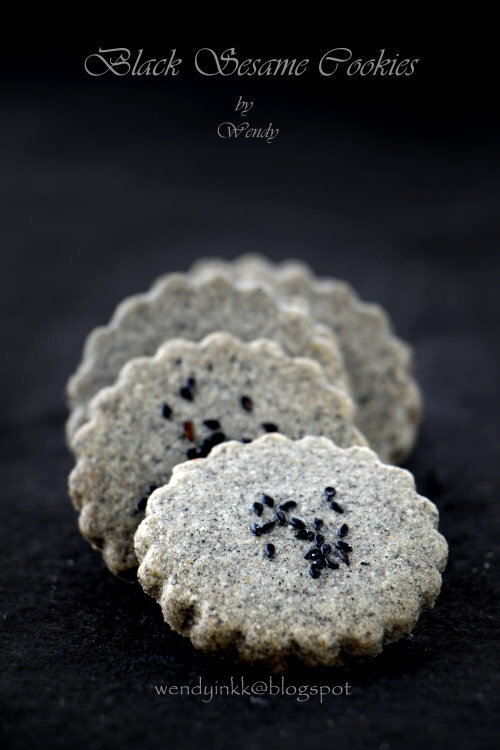 It is used in various types of kuih, so many that I can't name them all. 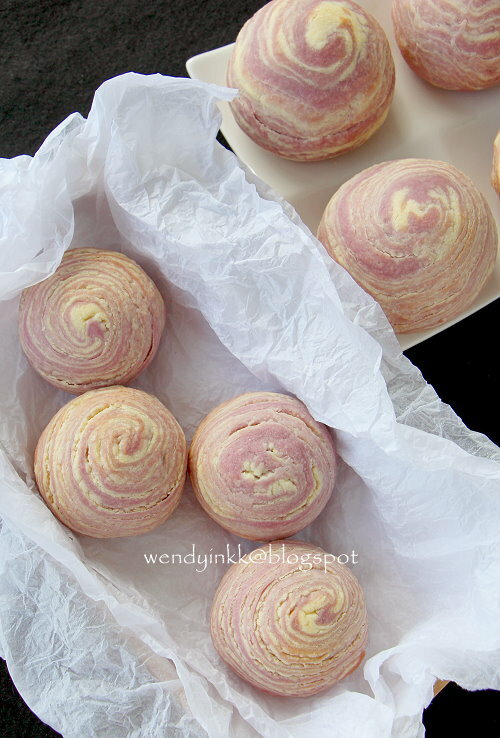 Besides in kuih, we also find this filling in buns. In my school, the afternoon session teachers love to organise 'makan makan'. Makan means eat in Malay. Food makes conversation and brings relationships closer, and so, we who are in the afternoon session are a cooperative close bunch. Back in those days we will take turns to treat each other. I can't bring home cooked food, so, each time I will just buy KFC, hehehe, and everybody's happy. 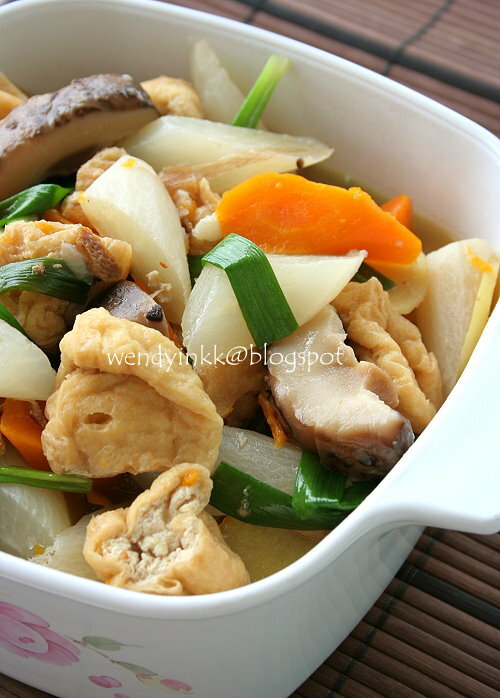 Nowadays, the practice slightly changed, we organised potlucks or collect money to order food. I found one place selling raspberries cheaper than most places by about 30% and so, how could I resist but get one punnet. I made this on impulse after googling for something to do on a Sunday afternoon. When the kids heard I was in the kitchen doing something, they ran in. Each asking me if they can help. With this being an easy bake, I agreed to let them help, all 3 of them. Lydia did the sifting and cream cheese mixture and Lyanne mixed the wet ingredients and helped with the final mixing. Not forgetting my boy with the raspberries. It was fun and enjoyable. A meat free dish. Flavourful, delicious! 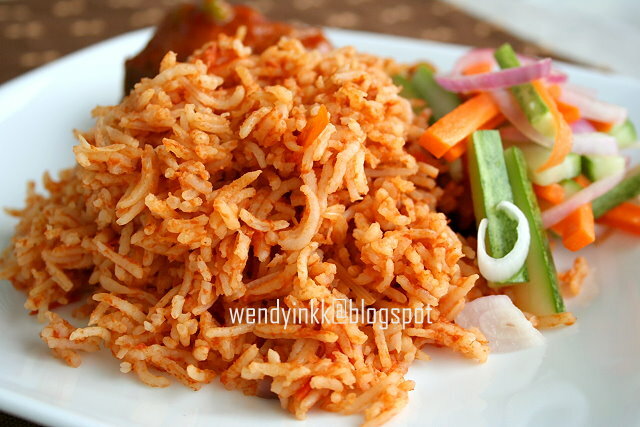 It's easy to cook, goes well with rice. When I was a small kid... around 4 or 5. 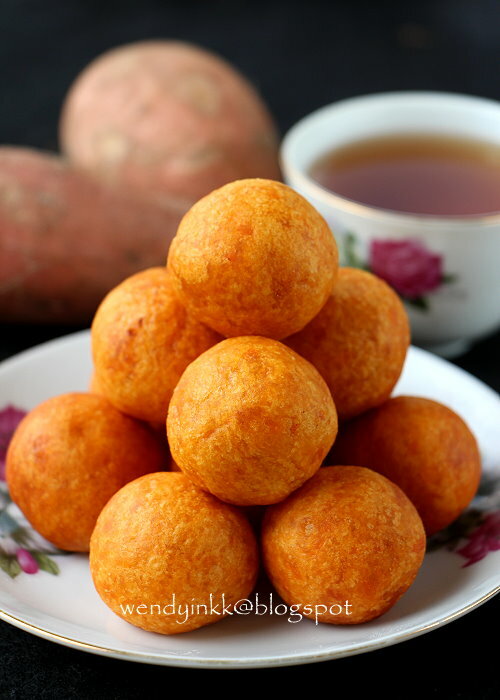 My grandaunt used to buy sweet potato balls from an elderly neighbour for my breakfast. This neighbour, whom we call as "Sou Cheh 苏姐' is a single lady, in her 70's with an adopted son. She sells traditional Cantonese snacks in the market, like sweet potato balls, jeen doy (煎堆 sesame balls) and dan shan (蛋散 syrupy egg crackers) to make a living. It was a holiday project with the kids. 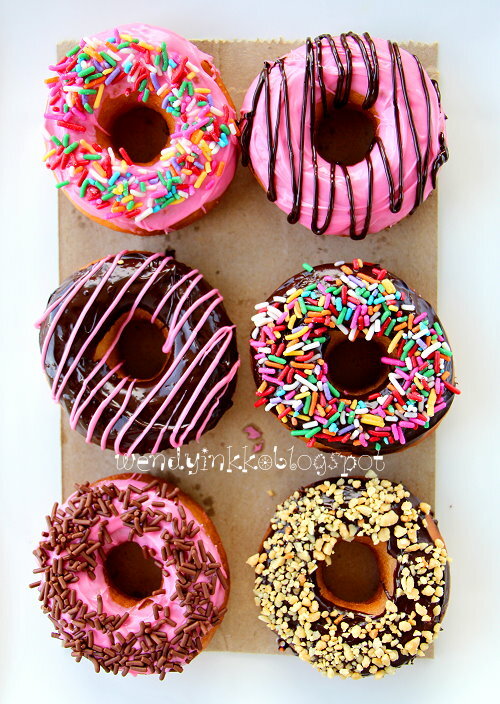 I promised them to make doughnuts for a long long time, just that it never came around. Bad mother, haha! I still owe them croissants, homemade ones. 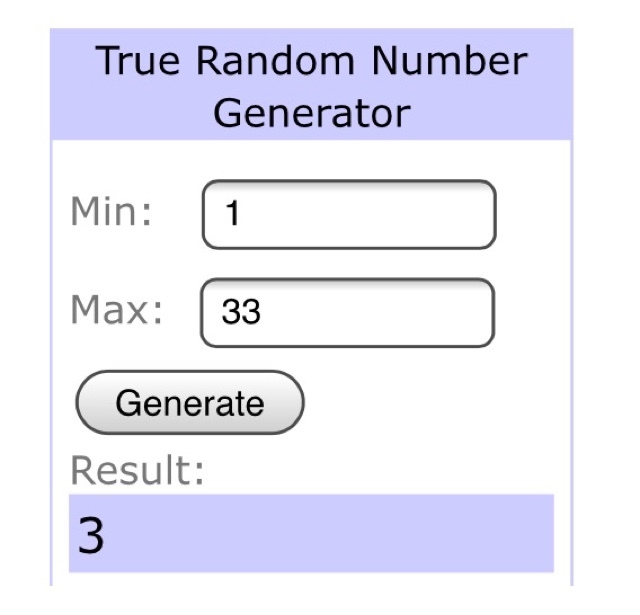 Hopefully I'll make them by this year. I manually kneaded these and the result was good enough for us. I first heard of this flower from Annie. And on one of my trips to KL, I spotted this at Dai Ma Herb Shop (One Utama). The price is quite cheap, I forgot how much but surely less than RM10 and one pack can last me few pots of soup. Blooming night cereus is from the Cactus family, cousins with the Dragonfruit. The flower is usually planted for it's fragrance, but the fragrance after it has dried is very mild. Long long ago.... I saw this cheesecake on My Kitchen. That's where the inspiration came from. My kids dubbed this as their all time fav cheesecake. I told them, it's very expensive to make, LOL. 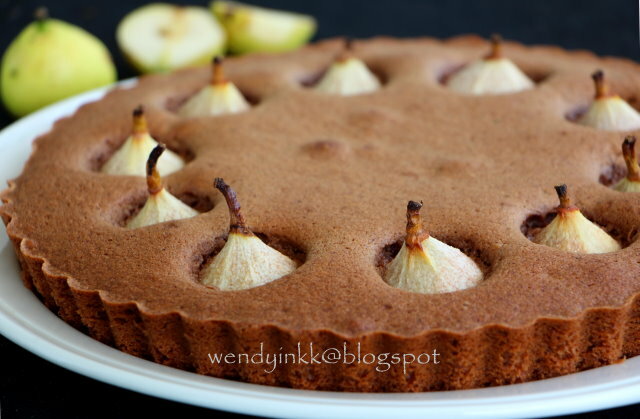 I made this two years ago, sorry yeah.. was too busy with MFF and AFF that all that I'm sharing now are all old recipes. I'm digging them out each week. It’s about fire. It’s about the wok. You can’t be afraid of high heat and cook this dish. I tried to follow the recipe as much as possible with the cook book except that I switched the amount for dried shrimp and meat. It wasn’t much like what I’ve eaten in Sichuan restaurants in Malaysia. 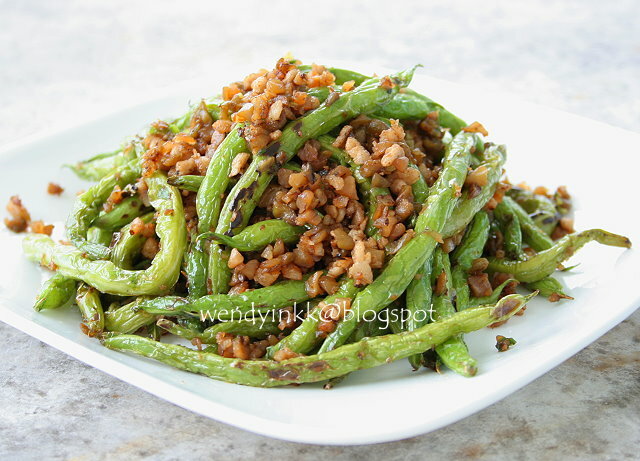 They tend to make it spicy and tie the whole dish together with cornstarch. But this version from this book is absolutely dry. I had 2 extra Dole bananas, after making an order of banoffee pie. They turned spotty and brown really quick in our weather. 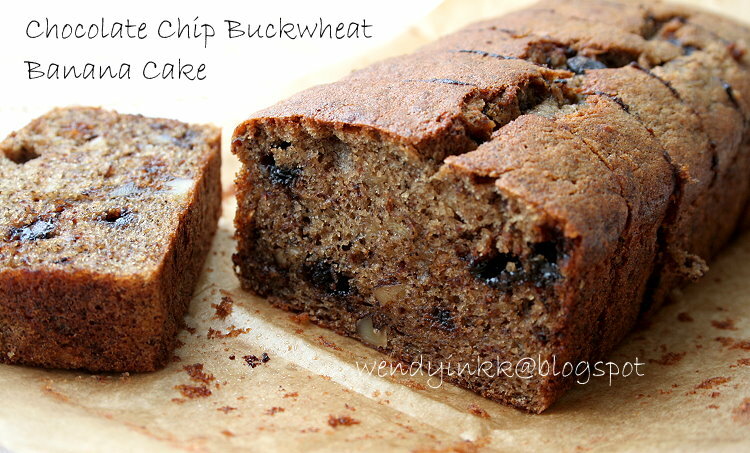 Didn't want to waste the over ripe bananas, I searched for a buckwheat banana bread or cake. Not knowing whether this existed, hahaha. But it does. So, I then adapted my own recipe with a recipe source to refer to, but I like the idea of adding chocolate chip to the cake. I’ve only eaten one thing made from buckwheat and that is soba noodles but that is not a bake. I’ve never eaten bakes made with buckwheat, not even buckwheat pancakes. So I was pretty curious about the taste and texture. It was in 2001 that I came up with this dish. It was inspired by my first taste of Agedashi Tofu. And for many years I have cooked it many times, this way. 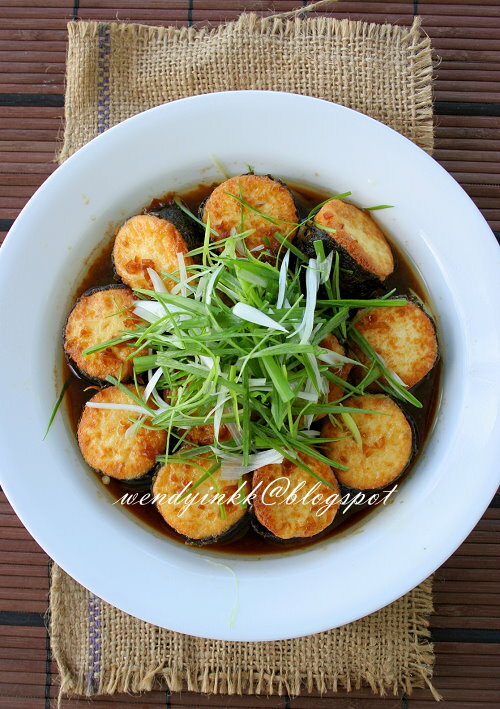 I've taken the pics of this dish many times throughout the years, starting from the first few months of blogging, and each time I cooked this again.. LOL. 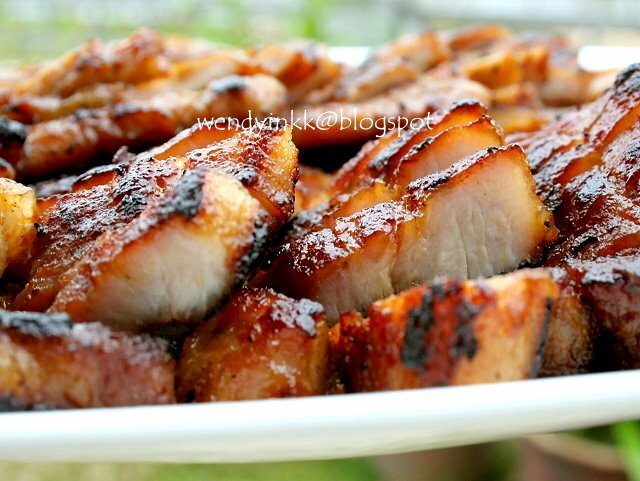 I just never shared this recipe for almost 7 years, not that I was reluctant too, but just never got around to do it. I don't even remember when did I make this. But I remembered I was hosting a dinner for relatives. I was hesitant to post this, as it didn't look pretty, because I compared it with Tesco's picture. Why did I didn't get the same effect? 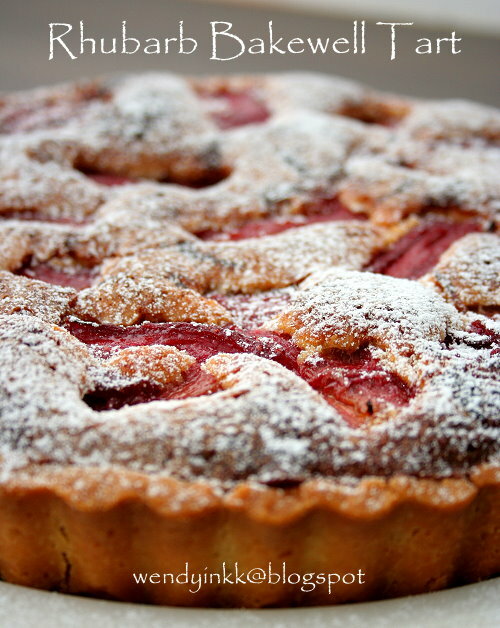 I thought I will bake this again one day and get a nicer shot, as it tasted really good. But after all these years... I just never got around doing it a second time. I shouldn't wait any longer. 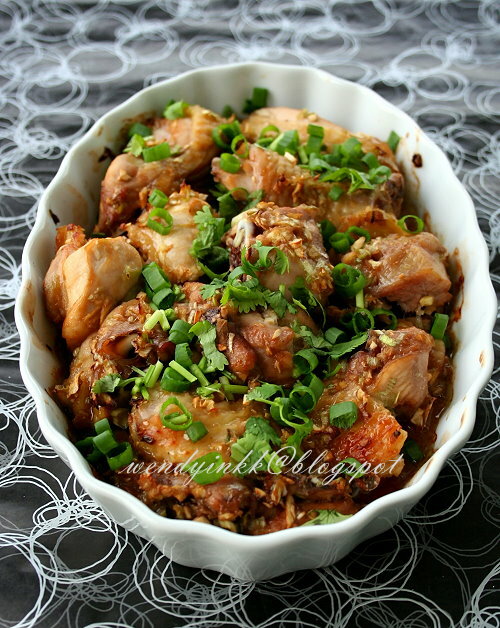 I loved to cook this when I was a teenager. It was easy and yummy. 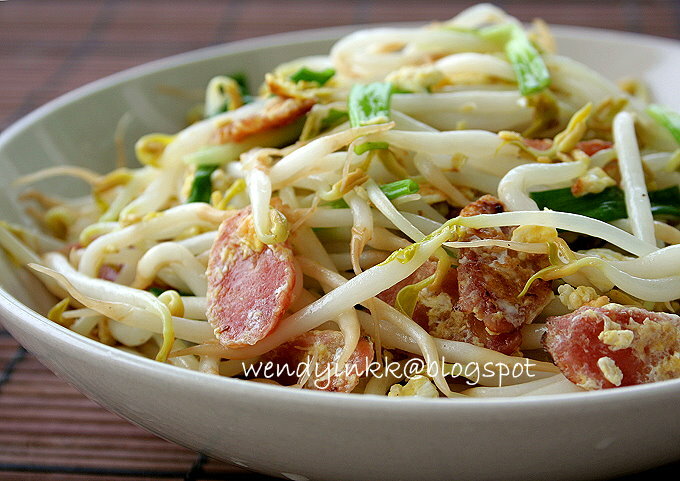 Some people pick the ends of the sprouts to make the dish look more presentable. For me, I can't be bothered about it. It's not that they are inedible. Add in some sliced chilli if you like it with some heat. Mango season is almost here. Almost. 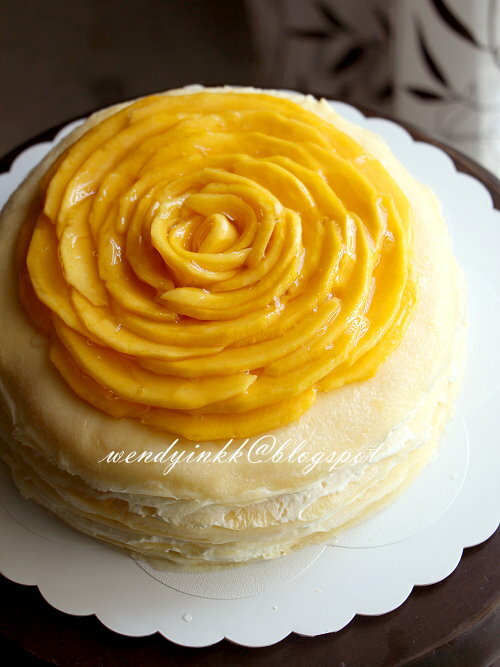 I haven't been posting a nice crepe recipe here since the not so nice Durian Pancake Rolls. 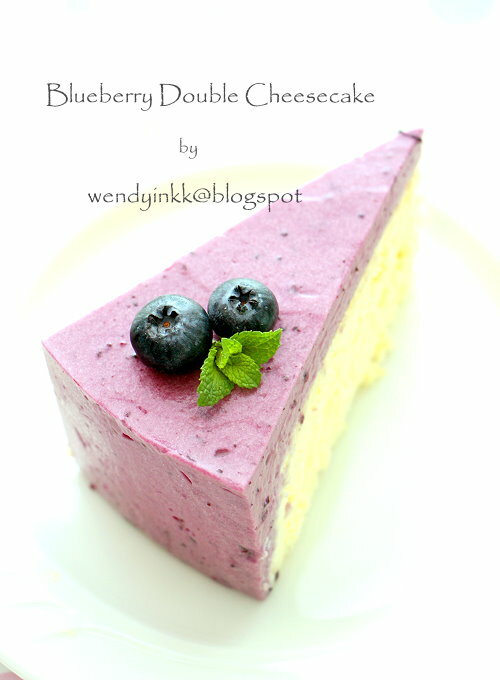 After that, I read up on a few other recipes and then, I found this recipe. I used this recipe and then changed it to metric, and kept it this way for more than 3 years, making breakfast crepes exactly the same way. My kids love it. 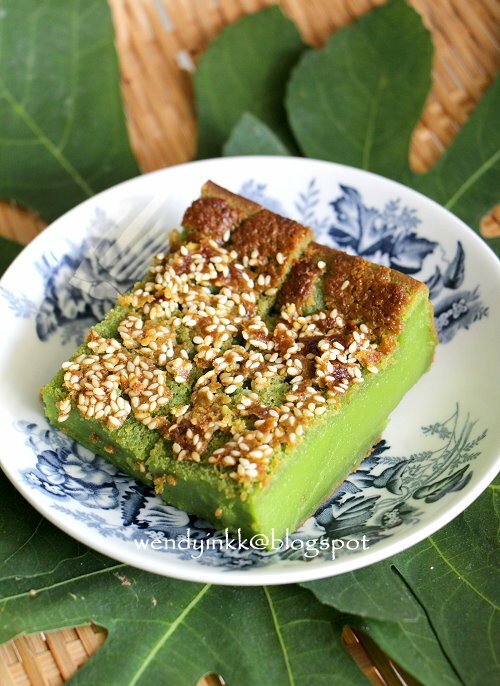 Kuih Bakar Pandan is a dense and rich baked cake, almost like a tropical clafoutis, but better. 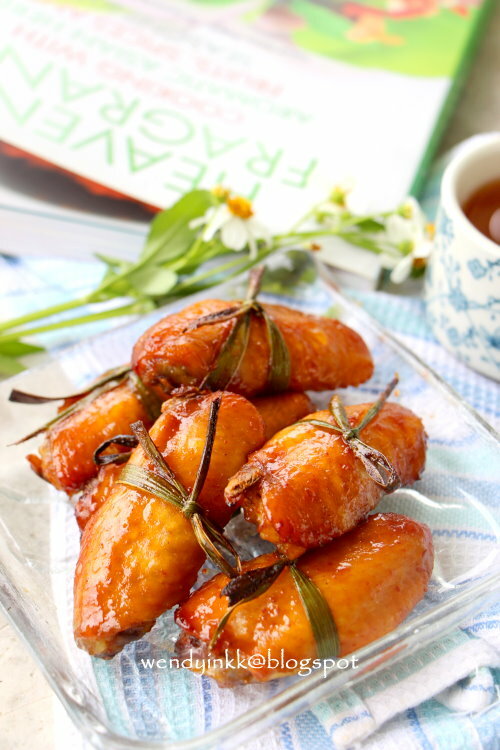 Some people do it in a flower shaped mould and hence the name changes to Kuih Bakar Kemboja. I'm not sure the Kemboja here refers to the Frangipani (Plumeria obtusa) or Cambodia, the country. In the Malay language, the same word is used for both flower and the country. I miss the smell of fresh bread from the oven, but kneading bread made from bread flour takes too much of my time. 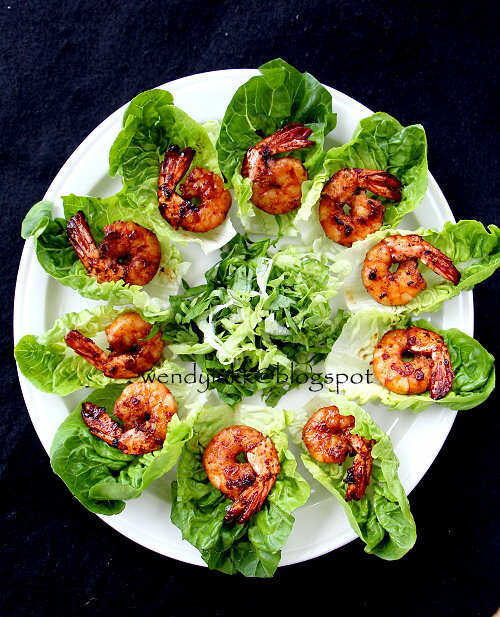 I was googling for some recipe and this image caught my attention. 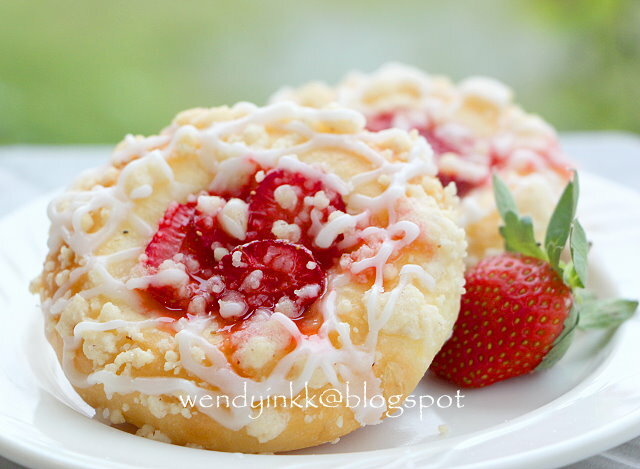 It was an image from a bakery in Poland, .. and the strawberry and the crumble and the icing, so yum looking.......but no recipe. So, I used the name and googled for a recipe. And settled with this recipe. My mind just kept thinking about it for days until I finally got my strawberries and turned my thoughts into reality. It's been quite a while I did something to add to my list of 'healthier options'. I'm a moderate eater. I eat everything, and the only thing I ever indulge in is vegetables, and my old buddies know how much vegetables I can eat in one sitting. In memory of Grandaunt. Happy 102 birthday, if you were still here. I do get occasional cravings for this kuih. No food colouring used, all natural. Bad. As my pandan plant is half dead, so I need to buy the leaves and now that I'm working, it's not that easy for me to drive out and get it as I wish. I have time constraints. 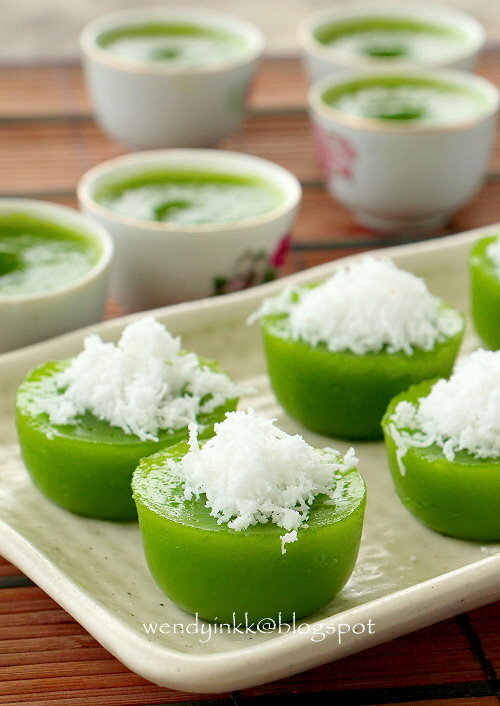 Some northern Nonya cookbooks will call this as Kuih Kosui Pandan, but in Home Science books, they are called as Kuih Lompang, the kuih in a cup that comes with a crater filled with grated coconut. 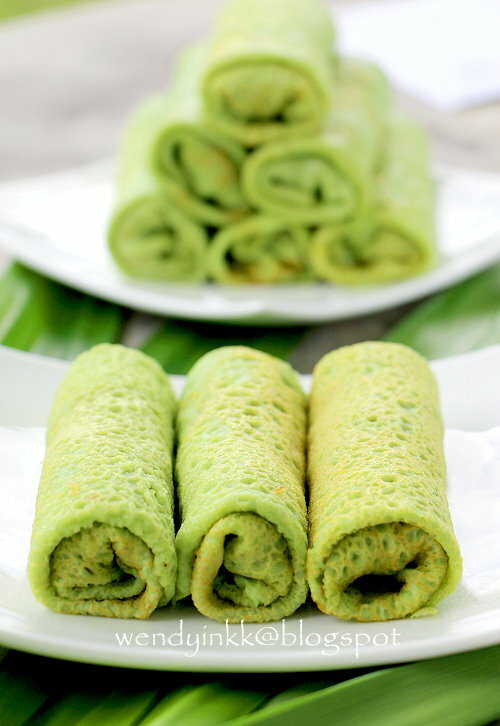 Kuih Lompang is the general name used in the Malay community. Sometimes I just feel soo lazy to wash up after cooking. Initially I wanted to steam the chicken and then cook the sauce to pour over, but the lazy bug hit me the last minute and I dumped everything in and baked it instead. Reducing a lot of washing up. I used just one bowl for marinating and another dish for baking. But if you want, just use the same baking dish to marinate. Even lesser to wash, haha! Paradise Pear is a type of pear that is small in size. So small I can pop the whole thing into my mouth in a go. The ones we get here are imported from Australia and are usually available from January to March, depending on your luck. These paradise pears aren't cheap and they cost almost RM1 each, and are sold by weight. I got my pears from Aeon and once, from the local night market. It's because of the timing... that I tend to keep these pears until they almost rot. I am just too busy around Chinese New Year. I made this cake 3 times and I finally got this posted. Tuna is a common fish in Malaysian cuisine. The local tuna is smaller in size than the ones we eat in Japanese restaurants or those found in colder waters. 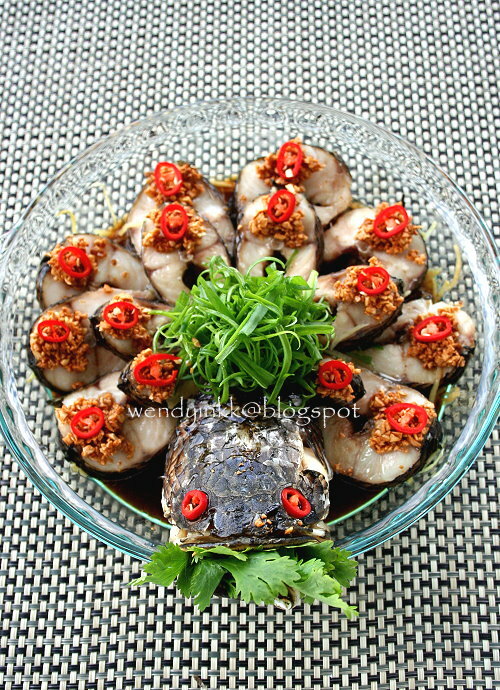 The local tuna is known as ikan tongkol and it's not an expensive fish to consume. There is another fish that looks almost the same, known as ikan kayu, and I wasn't able to distinguish between the two, until the fish monger placed them side by side. The local tuna, ikan tongkol's skin is actually bluish, looks pretty when the sun shines on it. 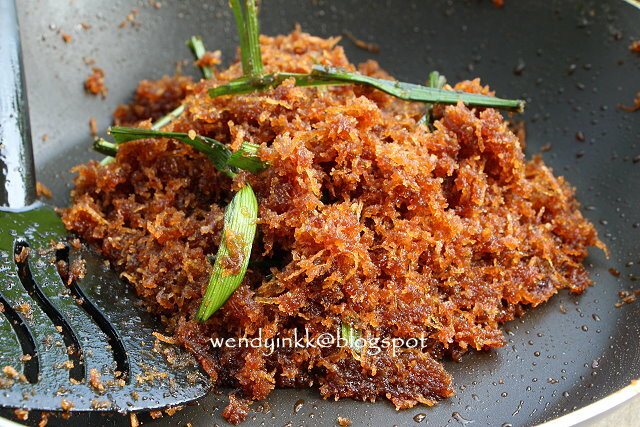 Ikan kayu has a much larger bloody area when cooked, tastes more fishy and has a drier texture. I love lamb and mutton and all the likes of them. It's the smell that I enjoy. But I'm not the biggest lamb fan in the house. After making a few tedious dishes... maybe a 5 minute dish will be a good choice. It's quite a no brainer.. with just prawns, some salt and teriyaki sauce.... oh yeah, oil as well. Showing you this recipe for now seems..... weird. I know it seems hard to find bamboo leaves at this moment, but I think some of you might have some half used packs left over from the last dumpling session. But then again, if you really want to get it, it's usually still available at Chinese ingredient grocery shops. We do eat dumpling the whole year long, just that it's more festive to eat it during the festival. 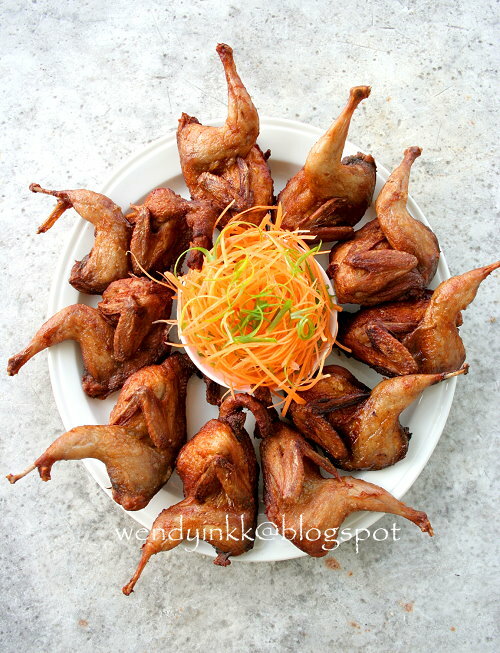 French quails are a type of quail. I didn't get them from France and neither were they raised in France. I didn't hunt down any peacock for this dish. Nor peahen. Nor its chicks or egg. It's just the method of arrangement that resembles a peacock. 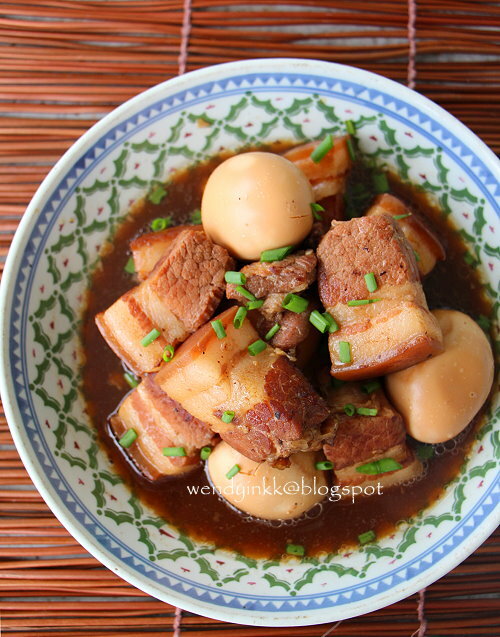 The auspicious Chinese name I gave this dish 绰绰有余, means, more than enough. And the 绰 (cheok), sounds like the Cantonese pronunciation for peacock. 海底金星... sea coconut, carrot and starfish 海底椰，金笋，海星. 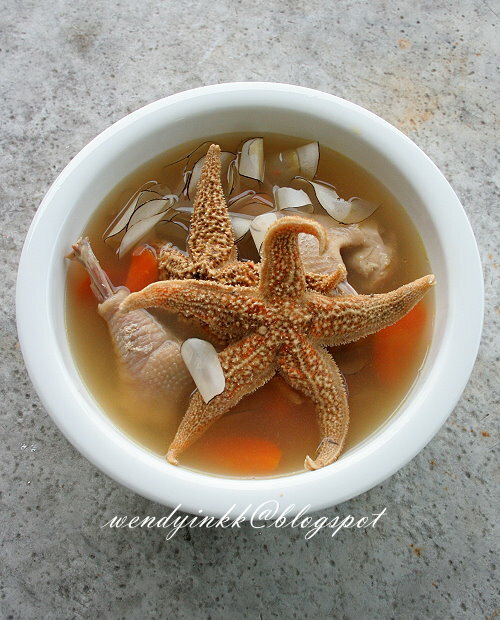 My kids squealed when they saw the starfish in the soup. Haha! Such a delight. And my girl asked me to cook it again. She likes the taste. I made this soup some time ago when I had guests for dinner. No one ever tasted starfish in anything before. No one said no to this bowl of soup. I'm glad everyone didn't feel disgusted. Black may not look auspicious for Lunar New Year, but i think most of us, do wear black during the festival nowadays. We have modernized, right? 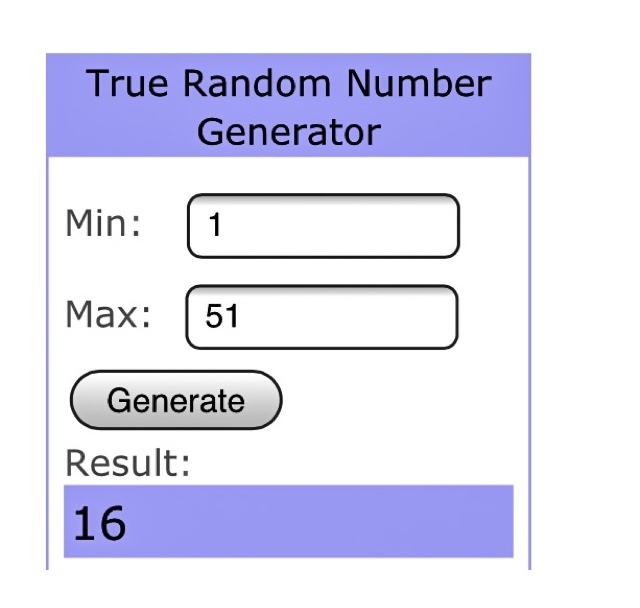 Hehehe. Yummy! 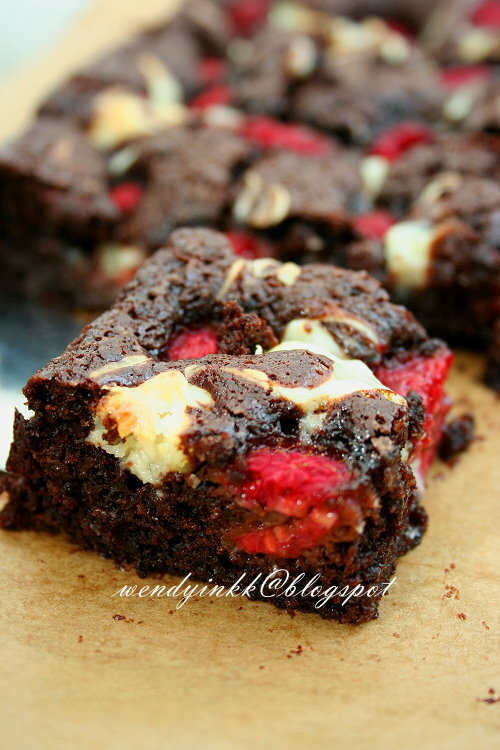 My hubby said these were so good. It was at Peabody's site that I first came to know of these cookies. 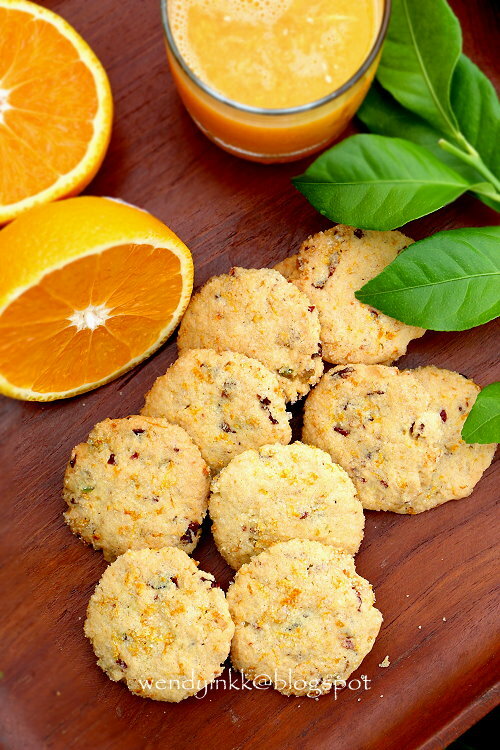 I like the refreshing taste of orange in this, with chewy cranberry bits that contrasts with the crisp cookie. The orange sugar coating adds some glitter to its outlook.